The building C.T.T.A., commitment between funcionalismo and sosteniblidad low-cost. The building C.T.T.A. 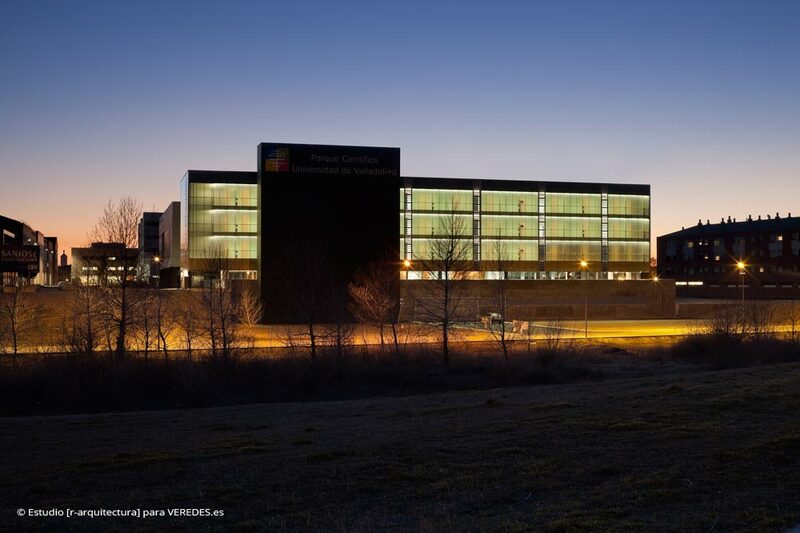 (Center of Transfer of Applied Technologies) is the result of a work developed throughout almost four years in the study of architecture vallisoletano Rodrigo Almonacid’s [r-architecture] for order of the Scientific Park University of Valladolid. The preliminary design presented to the contest of ideas in June, 2008 it turned out to be award winner with the first prize (according to the juror composed by Patxi Mangado, Luis Fernandez-Galiano and Juan Antonio Cortés, between others), with a qualified offer “Entropy Machine for a Sustainable Habitat”. There already an aesthetic commitment was formulated between the modern funcionalismo and the architecture bioclimática, with that it wants to appear to a born architecture of the abstraction and cleanliness visual but compatible with an energy efficiency that minimizes the impact of his “ecological fingerprint”. The final formalization answers to the definitive project written in 2010 under strong budgetary restrictions, in that a relation reached cost / surface of 998,91 €/m2, really low ratio for this typology destined for administrative use (offices and laboratories of scientific investigation), and always observing a reduction of future consumptions derived from the use and maintenance of the building. In functional terms, the C.T.T.A. 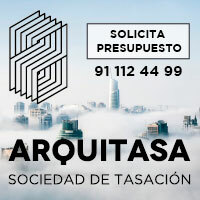 was conceived as a space of rotating and flexible occupation that was allowing the meeting between investigators of the university area and of the managerial world. Any accession on this building – platform had to assume a “nomadic” condition, where the permanency of spaces or his anchorage in the time would be vague: the condition of maximum flexibility supposed accepting the possibility of changes in the time of a natural way, as the first condition and sine qua odd number. The space was formed by means of the overlapping of floating trays where to lodge the areas of work. One was trying to obtain a certification ” isotropía functionally ” thanks to the versatility of the central thorn of technological infrastructures (a linear present patinillo in all the plants on low), and to the false ceilings of metallic opened muds and registrables for modules, with which it is endowed to all the enclosures of work. 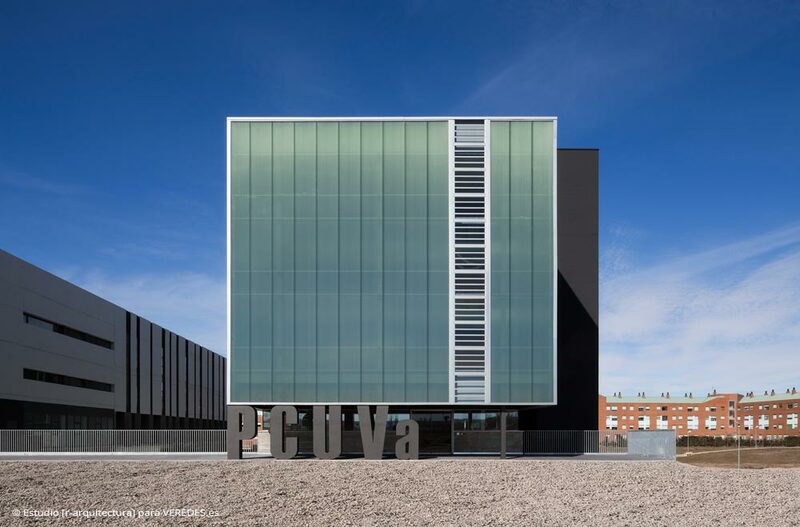 From the beginning, the aim was to bet for a piece of architecture that, in spite of his great volume and the limited free surrounding space, was showing with audacity his bold lightness inside the campus of the University of Valladolid in the one that registers. Opposite to the set of “heavy” neighboring buildings, it was chosen for the dispute, offering a light and delicate piece. 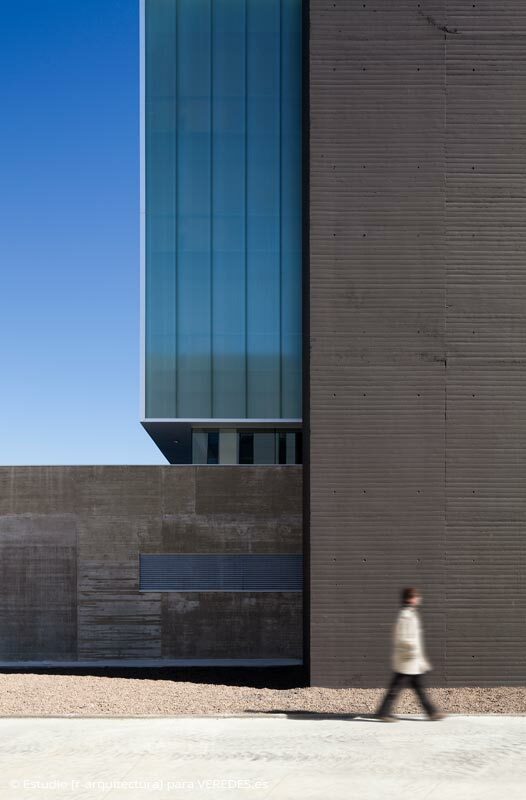 Aesthetically it was conceived to the building as the floating overlapping of a translucent and luminous volume on a massive and opaque podium, of more solid construction, which would solve the contact with the soil to level of semi-basement. Thus, the building is tensed in the rough contrast between the tectonic order and the estereo order. Between both orders there is inserted horizontally a transparent crack that seems to do levitar the light one on the heavy one, demonstrated furthermore if it fits for the horizontal slide of a piece with regard to other one. Two slender and mute black boxes of concrete vertebran the vertical communications of the building, giving up indexing the scale of the building, objecting this way his erect condition to the horizontalidad of the set. This abstract volumetric disposition became compatible by the aim to reduce the energetic losses across the surrounding one, on having created a volume of low shape factor. Due to this formal compactness, the air conditioning of the interior space diminished strictly to the working spaces (offices, laboratories, offices, rooms of meetings), isolating the residual spaces out of the principal volume (garage, quarters of facilities, stairs, bathroom, stores, etc.). Attending to the ordinances of the campus, the building was orientated longitudinally in direction I CAN – NOT. There was designed the surrounding principal completely translucent one in his four foreheads, an abstract solution in the formal thing and isótropa in the energetic thing (like ” isothermal box “, paraphrasing to Him Corbusier), that achieves an enormous capture of natural light (minimizing the use of the artificial lighting, one of the energetic major consumptions in office blocks). To optimize the passive architectural conditioning, the scheme was invested tipológico traditionally on having located the corridors making a detour periféricamente to the enclosures of work, with two only ones you were squeaking structural in longitudinal sense that they leave in projecting to the whole perimeter of the wrought ones. On having made it like that, these act as horizontal protections for the interior sombreamiento of the enclosures of work in summer, without in winter there prevent the thermal and light earnings due to the minor inclination of the solar beams. 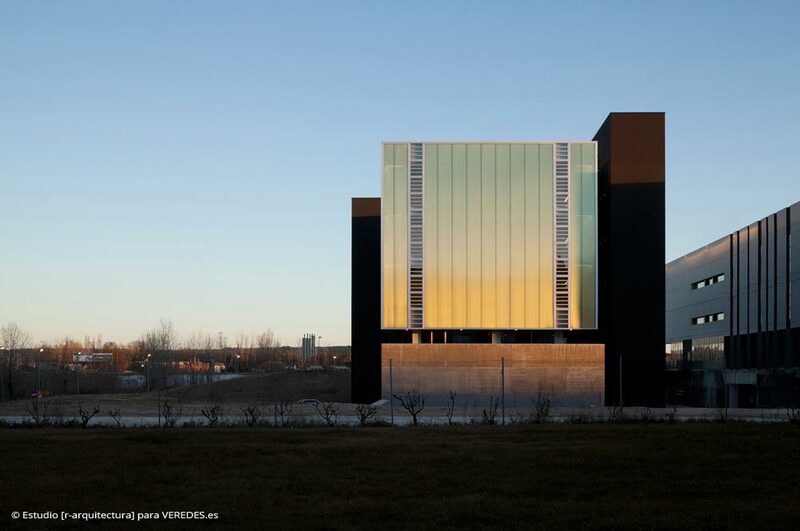 Both vertical cores (with stairs, elevator and bathroom), act as ” black bodies ” that absorb and retain the heat in winter, provide an effective sombreamiento with some with the zones most exposed to the overheating in summer, and increase the thermal global inertia of the building. The decision to alter the conventional typology has been, at last, one of the most fertile in all his aspects. 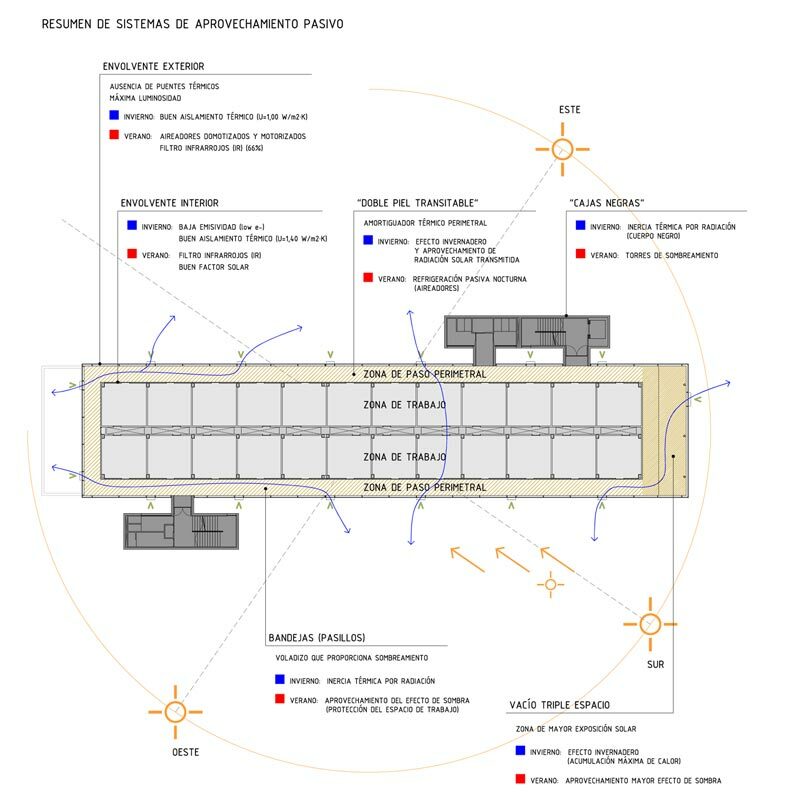 Beside achieving a major extent and luminosity in the spaces of traffic, aúnan spatially, formally and térmicamente three plants of offices, and uniformiza visually the translucent body from the exterior. 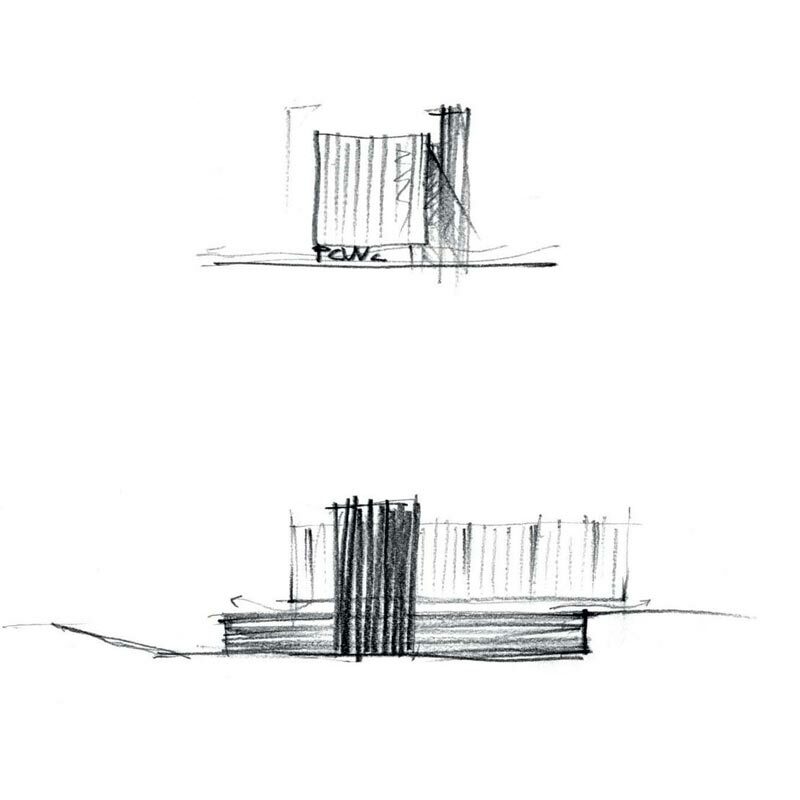 This has turned to the peripheral corridors in an intermediate space, a “double inhabitable skin” formed as peripheral constant band, and confined between the “exterior skin” of dovetailing panels of cellular polycarbonate of last generation (U=1,00 W/m2. 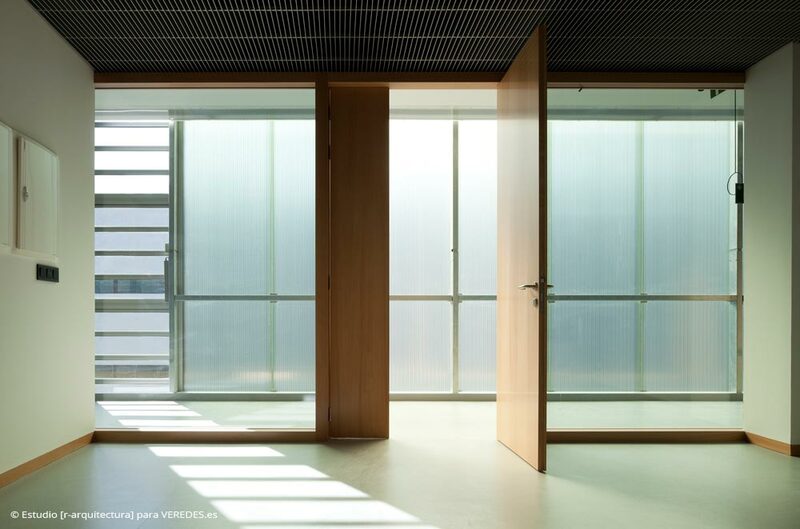 K) and the ” interior skin” of glass screens and wood of vaporized beech. The translucent condition of the exterior skin assures a high contribution of natural light and leaks great part of the infrared radiations without coming to complex systems of solar protection. 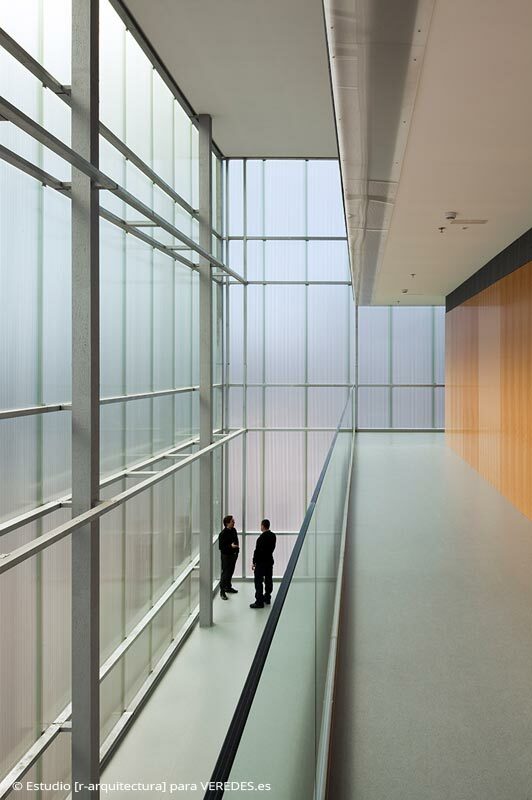 On the other hand, the interior skin of the screens, glazed of soil to ceiling, he assures a maximum utilization of the natural indirect lighting in the enclosures of work. 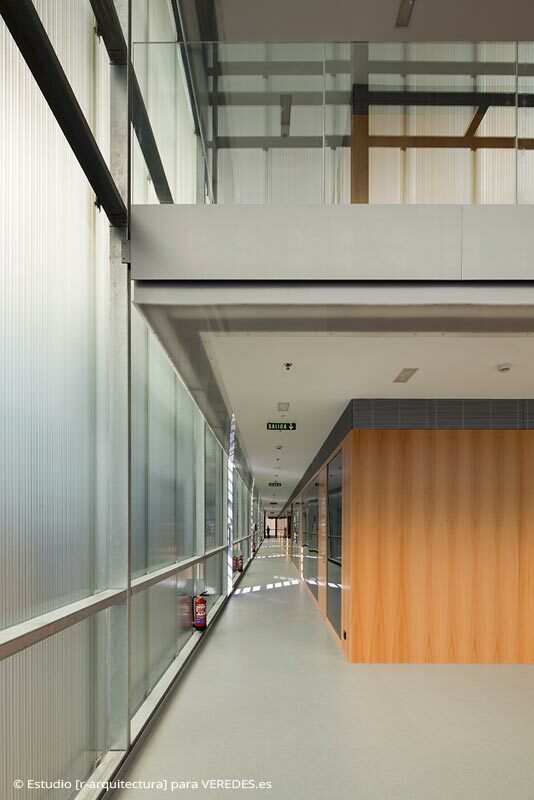 The glass in the corridors is double, with cap of fall emisividad and butiral of safety with sound transmission loss, increasing the performance of the winter heating inside the places and offering a changeable aspect in the interior that aúna intimacy and transparency in the offices. 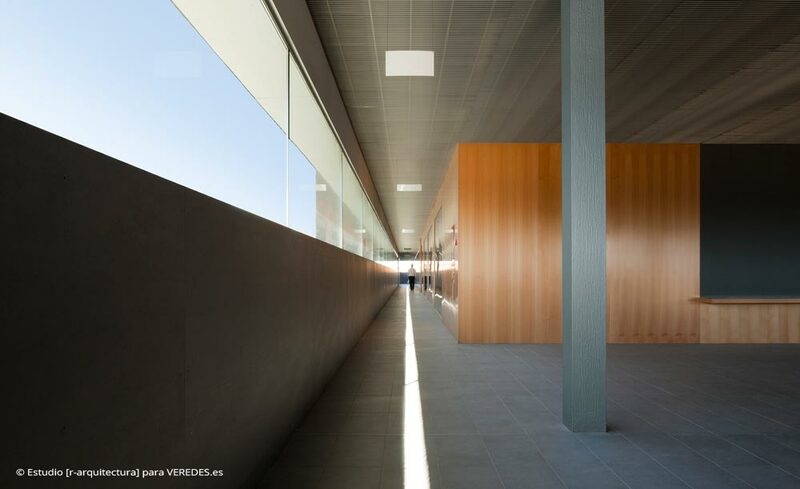 This strategy obtains this way an air coat and light between two skins, authentic ” absorber bioclimático ” between the exterior and interior conditions, which it optimizes the architectural passive solutions and reduces consumptions for active conditioning of the interior. The generated “greenhouse effect” periféricamente will allow to reduce notably the consumption of the heating in the months of extreme cold, managing to do without her in the months of intermediate temperatures (spring / autumn). And in summer, the porosity of the exterior skin will allow a free cooling in night schedule thanks to the striping of practicable windows. By means of the installation of a system of home automated centralized control, the use of the facilities is optimized to achieve an adjustment more come closer the existing demand in every moment, managing to obtain of them the maximum efficiency to reduce the consumptions. This system controls the functioning of the thermal facilities (system of recovery entálpica in the equipments of mechanical ventilation, variators of frequency in the bombs of traffic, etc. ), of the artificial lighting (with systems of regulation and control, as well as detection of presence), and even the opening motorized of the windows of glass muds inserted in the fronts, attending to a series of exterior and interior probes distributed by the building. 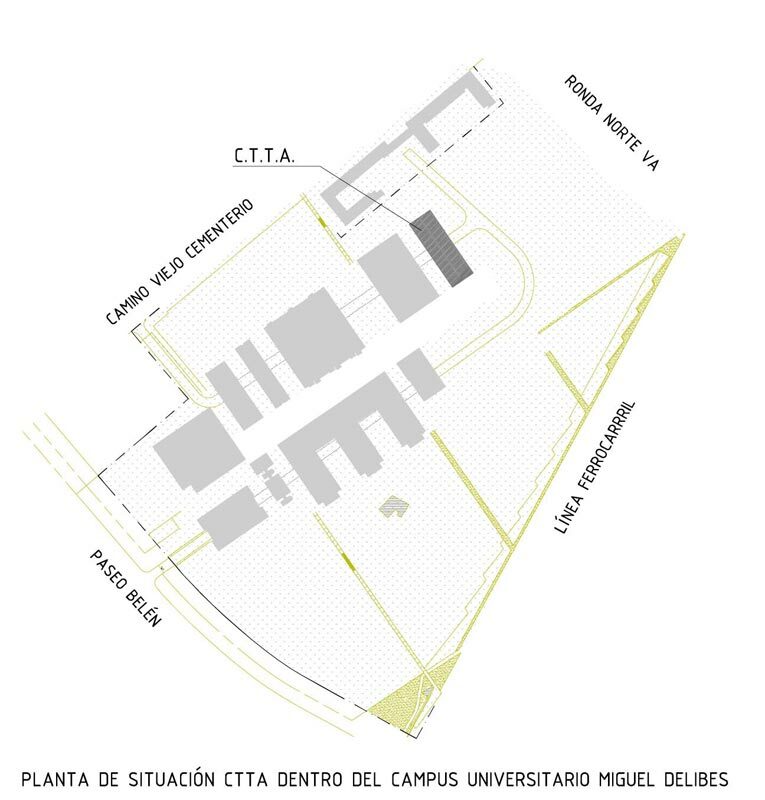 Collaborators: CYA PROYECTOS (Facilities and energy efficiency), PEJARBO S.L. 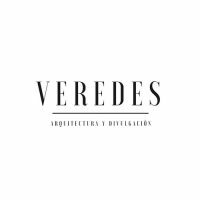 (structures), BENITO GARCÍA P. (Direction of execution of the work and coordinator of safety and health), RAQUEL CABRERO O. (Delineation and models), Lluís Casals (photography). Basic project and of Execution: I shrivel, 2010. Term of work: 14 months (December, 2010 – January, 2012). Preliminary design: 1er. I reward contest of ideas 2008 summoned by the University of Valladolid and the Architects’ Official College of Valladolid. Juror: Patxi Mangado, Juan Antonio Cortés, Luis Fernandez-Galiano.